The image is a startling one, not for the portrait of athletic prowess it paints (impressive though that is), but rather because it is so powerfully at odds with the abiding image of Brahms that has been handed down to us: the older, gruff, grizzly bear of a man, 'rather taciturn and jerky as a rule, and notoriously difficult to carry on a conversation with', as Dame Ethel Smyth once observed. Still, to be presented with an image of Brahms the man apparently contrary to the icon that Brahms the composer has become seems useful prior to a discussion of his chamber and instrumental music - a body of work which proves to be every bit as robust and full of life as the young athlete whose prodigious musical talents made him heaven-blessed and, at least in the eyes of the Schumann family, heaven-sent. 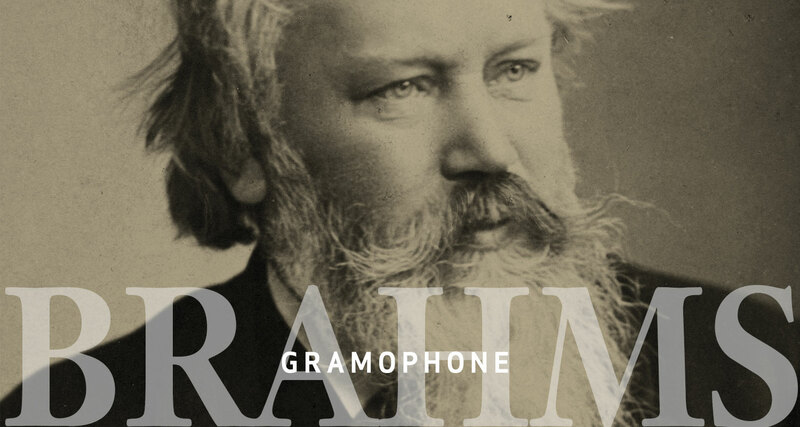 Although Brahms was to show himself a master of every musical form save opera, it was in the intimate domain of the chamber and solo repertoire that he was to achieve genius. And while he was to destroy more work than he consented to publish, those chamber compositions he did commit to posterity - a mere two dozen pieces in all - all court the accolade of 'masterpiece'. It has been a matter of both good fortune and historical inconvenience for Brahms that he came after Beethoven. Difficult though he found it living in the great man's shadow, how impossible it would have been had he had to share the limelight with 'that giant whose steps I always hear behind me'. In an age of musical drift where time and fashion were transfiguring the classical into the romantic, Brahms adopted an attitude that would not have been out of place in the latter part of our own century: he determined to be concerned only with himself, his own musical attitudes and, such as they were, his own ambitions. It is probably no accident that the first two works with attributed opus numbers that Brahms allowed to survive are piano sonatas. His own prowess at the keyboard was well known and had been honed by adolescent employment in dubious dancehalls and taverns and in later and less ignominious engagements as an accompanist to the violinist Eduard Reményi. It was through Reményi that Brahms was to meet another violinist, Joseph Joachim, the dedicatee of the Op 1 C major Piano Sonata, completed and published in 1853. Though Liszt, arch advocate of Weimar progressivism, had played some of the sonata to its composer's approval (the E flat minor Scherzo particularly appealed) it is likely that the general intent of the writing - most immediately its emphatically classical first subject and the almost Schubertian exploration of keys in the second subject - would not have been sufficiently 'modern' or forward-looking enough to merit Brahms's wider acceptance amongst Liszt's more hard-line cronies. Right from the start the characteristic conundrum that informs all of Brahms's music is revealed: that the present has no real definition for him unless it is as an amalgam of the past and the personal. The future for Brahms, as for few other composers, is left to take care of itself. Yet, paradoxically, it's the very ambivalence of this stance that enabled him to look forward, to explore new possibilities in his music with such freedom. Brahms would never willingly have allowed himself to be a hostage to posterity just as he never submitted to the stylistic fetters of fashion. Emanuel Ax is also sensitive to any implication that Brahms's music is somehow diminished by its references to both recent and far-distant idioms. 'He wasn't someone who was stuck in the mid-nineteenth century slavishly copying the model of Beethoven or Bach. Not at all! He was certainly interested in using old forms, but his music is always pulsing with life and is always adventurous and fresh.' And just as he refuses to criticize Brahms for looking backwards, so too his resistance to accusations that the pace of forward movement in his music was slower than it ought to have been. 'Brahms was no one's patsy when it came to looking ahead,' he argues, citing the 'pretty astonishing ending' of the F minor Piano Sonata with its forceful sonorities and articulate polyphonic skill as proof of such. It may have been due to the influence of Schumann, who preferred the tone-poem or Fantasiestück to the sonata, that Brahms decided to abandon the piano sonata altogether, but even without Schumann's prompting, it is likely Brahms would have developed in similar fashion towards freer forms; the intermezzo fourth movement of the F minor Sonata surely a clue to such possibilities. That same late collection also contained the G minor Ballade, which returns to a form Brahms had first investigated in the Four Ballades nearly four decades earlier in 1854, the same year as he wrote his Variations on a Theme by Robert Schumann. The sheer variety of both these early works strongly hinted at the new directions Brahms was about to take. Inheriting the ballade form from Chopin, he seems to have exhausted its usefulness almost immediately. Brahms seems to have enjoyed the freedom the flexible schematics of variations allowed him. He had used the mechanism in the slow movements of his first two piano sonatas (albeit in somewhat adulterated form) and in his Op 18 Sextet and was to readily employ the relatively unconfined form again. A set based on an original theme (Op 21 No 1), with its equal stress on harmony and melody, showed that the variation was also a vital arena for him to develop ideas about content as well as form. Tle Op 39 Waltzes of 1865, originally written for four-hand piano and subsequently transcribed for solo piano, were 'innocent waltzes in Schubertian form' according to Brahms himself, happily betraying his unabashed fondness for the music of Johann Strauss. A larger work had preceded the Piano Quintet in 1862, though this, the Op 18 B flat Sextet, was for string ensemble (two each of violins, violas and cellos). It was an audacious undertaking but a successful one and represented a paradigm shift to compositional maturity for the then 29-year-old Brahms. By the time a Second Sextet in G major appeared three years later, the problem of cello dynamics that had dogged the opening of the First (especially when played at the full forte indicated by Brahms) had been ironed out. Both works come in for praise from Isaac Stern for their 'most wonderful understanding of the sound of string instruments' and the 'moments of such gorgeous melodic lines for all the instruments, but particularly for the violin and first viola and first cello'. In the same year that Brahms had begun to work on the string quartets, he wrote his only Horn Trio (his only wind chamber work that did not employ the clarinet). Both it and the E minor Cello Sonata (Op 38), completed that same year, bespoke of his mother's death. For cellist Steven Isserlis, that grave emotional impulse in the music produces some of the most memorable sounds Brahms ever wrote. The F major Cello Sonata was one of three chamber works written in quick succession at Lake Thun. The other two were his Second Violin Sonata (the Op 100, A major) and the C minor Piano Trio, Op 101. Brahms had written his First Violin Sonata - in G major, Op 78 seven years earlier during another idyllic summer, this one spent at Portschauh. All three so-called Thun Sonatas, though vastly different in character, are held by common consent to deserve the appellation of masterpiece. Isaac Stern certainly thinks so. Rainer Schmidt, first violinist with the Hagen Quartet and currently preparing to record the sonatas takes a less euphoric view but holds them in just as great esteem. 'When you think that in the German-speaking countries between 1850 and 1900 there is almost nothing for violin and piano but the Brahms sonatas, and you realize what absolute masterpieces they are, the scale of his achievement begins to make itself very apparent.' But should we think of them as violin or piano sonatas? Emanuel Ax argues in favour of pianistic prominence in the case of the duo sonatas for both violin and cello combination. 'They're very much piano solo pieces with the addition of another voice. At best the violin [or cello] is an equal partner.' Interesting, then, to discover that Schmidt confesses to 'always learning the sonatas from the piano parts because it's all in the piano'. Neither man, though, is suggesting any deliberate inequality of emphasis on Brahms's part. 'He's very successful in assigning the right registers to each instrument so everything can be heard,' adds Ax but cannily observes that, 'we're not dealing with vertically oriented music here, but with a multilayered, horizontal texture.' That's a weighty consideration in any discussion of the piano-supported chamber music. In the century since his death, Brahms has been incrementally moving out of Beethoven's time-shortened shadow. As he at last comes fully into the light, perhaps the true scale of his own stature will finally be acknowledged and applauded. One thing is certain: in another hundred years, as Isaac Stern fervently believes, the music of Johannes Brahms will still be played and still be loved.